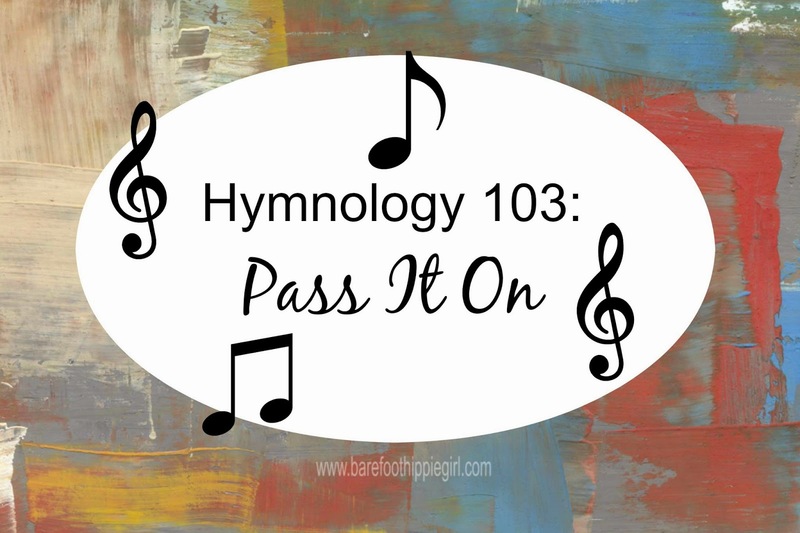 On Tuesday, we talked about how the history of hymnology is the history of Christianity. They are an integral part of each other. Yesterday we focused more on individuals, specific hymns and their backstories. We said that if the history of hymns is the history of Christianity, then the backstories of individual hymns are the stories of Christians and their God. We must learn, know and teach these hymns. As we know them, their words draw us closer to God. As we experience their comfort and collective worship, they become part of our story and history. As we teach the hymns to the next generation, they can become part of their history. But, in this day and age of power points and praise bands, we are letting this heritage of hymns, Christianity and history slip through our fingers. While there is nothing at all wrong with the new or newer hymns, we should not neglect the old simply because we now have new. We need to be dipping from the old, new and in-between in our hymn singing. We need to make a concerted effort to teach the hymns to the next generation. We need to teach them the hymns so that they learn how to read music, and so they can be comforted, challenged and encouraged by these powerful lyrics. We need to teach the hymns so that the big picture heritage is not forgotten and so that the individual stories are remembered. Children are capable of learning even difficult hymns. Meres was just sitting next to me singing the chorus of Trust and Obey. She learned it at BSF. She is 3. Children have a great capacity for memorization. Their brains are not stuffed full of information which allows them to easily absorb information. Plus, music is the perfect vehicle for memorization. When words are combined with music their sticking power greatly increases. Music engages both the right and left sides of the brain. When you are teaching a child a hymn, there are some concepts you should cover. -A hymn in a hymnal does not read the same as a poem in a book or even the lyrics of a hymn on a screen. Music is read line by line until the end, and then you go back to the beginning. If that is not expressly taught, it will not be learned. -The author and composer. The author's name is usually in the upper left hand corner of the hymn, and the composer's name is in the right hand corner. You can use CyberHymnal.org or Kenneth Osbeck's 101 Hymn Stories to get additional information about the hymn. -You can choose to sing with accompaniment or not. It probably depends on whether you own and can play an instrument. If the hymn is new to you as well as to those you are teaching it to, YouTube is a fantastic resource. You can listen to the music, often with the words sung and written. It is very helpful. -Hymns should be sung at a good tempo. This does not mean faster than a horse race. But, at a decent clip. That way the melody and harmony are not lost between notes. Of course you would take it down a notch for more reflective hymns. -The best way to learn anything is through repetition. I have found that it generally takes 5-10 singings for a new hymn to start to take. The words and tunes begin to be familiar. -Explanation is key when teaching an unfamiliar hymn. If you are teaching a hymn to a child, you must think like a child in order to explain the big word's meanings. Put difficult words and concepts into the simplest form possible. Immortal=can't die. Invisible-can't see it. Inaccessible-can't get to it. I find that it is good to go over these meanings with adults too. We get into the habit of singing old English words that are not commonly used anymore. And we have no idea what they mean. Some hymns should be explained word by word (Immortal, Invisible). Some hymns are more word picture hymns. (A Mighty Fortress) There might be some words that need explained, but you want to get across the major picture the author has written about-that of a castle-fortress and a war between God and the devil, with their respective armies. Satan is quite the enemy, but God is the victor. As you teach the next generation these hymns, they are going to start humming their words around the town. They will be able to join in the singing at church which will increase their enjoyment in the proceedings. The words and tunes will be tucked in the hearts and in times of trials and celebration, they will pop out to comfort, encourage, challenge and bless them. And through them, the blessing will continue on and on. So, what do you think? Do you think there is a need to learn and teach the hymns? What is your plan to do something about that?